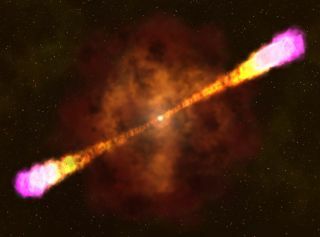 An artist's illustration of a gamma-ray burst, an energetic blast of jets that fly at nearly the speed of light from a massive star collapsing into a black hole. New research has revealed more about how the blasts are generated and how they evolve over time. An ultrapowerful, superfast explosion in space is providing new insight into how dying stars turn into black holes. An international team of researchers looked at a gamma-ray explosion called GRB 160625B that brightened the sky in June 2016. Gamma-ray bursts are among the most powerful explosions in the universe, but they are typically tough to track because they are very short-lived (sometimes lasting just a few milliseconds). "In a matter of seconds, the process can emit as much energy as a star the size of our sun would in its entire lifetime," Troja said in a statement. "We are very interested to learn how this is possible." Two key findings emerged from the observations, gathered using several ground- and space-based telescopes. The first step was better model what happens as the dying star collapses. The data suggests that the black hole creates a strong magnetic field that initially overwhelms jets of matter and energy formed because of the explosion. Then, the magnetic field breaks down, the study authors said. In the next phase, the magnetic field diminishes, allowing matter to dominate the jets. Before, scientists thought that jets could be dominated only by the magnetic field or matter — not both. Another insight concerns what kind of radiation is responsible for the bright phase at the beginning of the burst, which astronomers call the "prompt" phase. Before, several types of radiation were considered, including so-called blackbody radiation (heat emission from an object) and inverse Compton radiation (which happens when accelerated particles transfer energy to photons), according to the statement. It turns out that a phenomenon called synchrotron radiation is behind the prompt phase. This kind of radiation happens when electrons accelerate in a curved or spiral pathway, propelled along by an organized magnetic field. "Synchrotron radiation is the only emission mechanism that can create the same degree of polarization and the same spectrum we observed early in the burst," Troja said. The fading afterglow of GRB 160625B, a gamma-ray burst recorded in June 2016. Here, data from Arizona State University's Reionization And Transients Infrared (RATIR) camera, on a telescope at Mexico's National Astronomical Observatory in Baja California, shows the burst from June 26 to Aug. 20, 2016. "Our study provides convincing evidence that the prompt gamma-ray burst emission is driven by synchrotron radiation," she added. "This is an important achievement because, despite decades of investigation, the physical mechanism that drives gamma-ray bursts had not yet been unambiguously identified." Gathering information about GRB 160625B required many telescopes to work together quickly. NASA's Fermi Gamma-ray Space Telescope first saw the explosion, and the ground-based Russia's MASTER-IAC telescope, which is located at the Teide Observatory in Spain's Canary Islands, quickly joined with observations in optical light. MASTER-IAC's observations were key to understanding the evolution of GRB 160625B's magnetic field, the research team said. The magnetic field can influence polarized light (light waves that vibrate in a single plane) emanating from the burst. In a rare achievement, the telescope measured the proportion of polarized light to total light through almost the entire explosion. "There is very little data on polarized emission from gamma-ray bursts. This burst was unique because we caught the polarization state at an early stage," said study co-author Alexander Kutyrev, an associate astronomy research scientist at the University of Maryland and an associate scientist at NASA's Goddard Space Flight Center. "This is hard to do because it requires a very fast reaction time, and there are relatively few telescopes with this capability," Kutyrev added. "This paper shows how much can be done, but to get results like this consistently, we will need new rapid-response facilities for observing gamma-ray bursts." Other participating telescopes included NASA's Swift Gamma-ray Burst Mission (X-ray and ultraviolet), the multi-institution Reionization and Transient Infrared/Optical Project camera (at Mexico's National Astronomical Observatory in Baja California), the National Radio Astronomy Observatory's Very Large Array in New Mexico, and the Commonwealth Scientific Industrial Research Organisation's Australia Telescope Compact Array. The new research was detailed today (July 26) in the journal Nature.